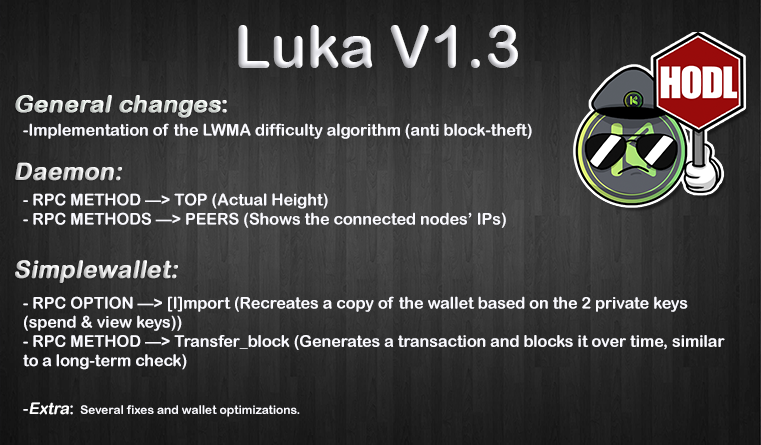 After working in the shadows for some time, we are glad to announce the release of one of our latest feats: Luka’s 1.3.0 update, denominated ”Phoenix”. The name was suggested by one of our telegram users in order to denote our ”rise” after being off the record for a while. The update comes along with a new simplewallet version which has to be downloaded from the ”Wallets” section in order to synchronize the Network from block #145,000 and onwards. The web and mobile wallet will also receive their respective updates. Do not forget to enable the blog in your wallet to keep updated with our news and developments!